Hello and Happy Saturday! 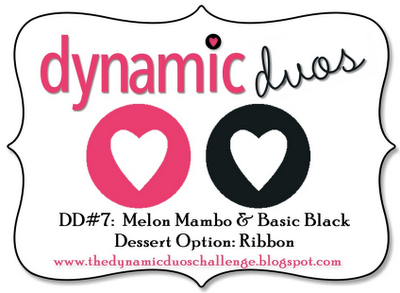 It's time for another challenge over at Dynamic Duos. This week, we are highlighting one of my favorite colors EVER in our "Black Tie" combo...Melon Mambo paired with Basic Black. My, oh my!! Our "dessert option" this week is RIBBON and how can you resist that? I just received a HUGE box of goodies from the new SU! catalog, including this fabulous stamp set called Bootiful Occasions. In true Texas style, I had some rootin' tootin' fun showcasing this blinged-out "Boot-day" card! I used the awesome sketch from Freshly Made Sketches for inspiration this week. I used some of the *new* SU! embossing folders on this one: Fancy Fan behind the fussy-cut boot and the Chevron Embossing folder on the left panel. Of course, in Texas we tend to go BIG, so I had fun with the polka dots and the blinged accents. Check out the jeweled button accents around the sentiment. They are new and I just love them! The boot and the sentiment are heat embossed, too. A quick shot of the inside of the card, continuing the birthday cheer with a "Kick up yer boots" sentiment. Yee haw!! Pink boot? Definitely an AM card! :) Great use of all those new goodies! I KNEW I wanted this set - your hot pink cowboy boot is wonderful!! 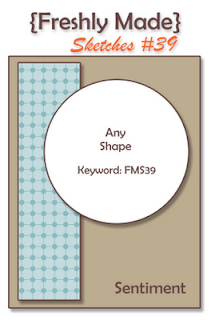 I love the various embossing folders! Oh, this is too fun, Anne Marie! :) Makes me smile!! Just love all the little details you put into it and that boot with its bling is adorable!!! Enjoy your weekend! Oh Anne Marie! I LOVE it!!! It's so adorable and classy all at the same time! I love the colours and really love that boot stamp...I think I may have to buy that one!!! Thanks for joining us this week at Freshly Made Sketches! Super cute....that set is on my wish list, even more now! I would have said this was a recent pic of you & your sis...you haven't changed a bit! I adore this card!!! The rhinestones and facet buttons are the perfect touch! Everything about this card is fun! No one rocks boots like a Texas cowgirl! Pink and black? Wowza! Love it - and love seeing all of the new stuff! Such a fun card using those great colors. I'm not a boot girl, but if I were, these would be for me. When I saw the colors for this challenge, I immediately thought of you!! Love this card......that boot is PERFECT (and I have mine on order right now!). So cute in all the pink and black! Great "Texas" card! 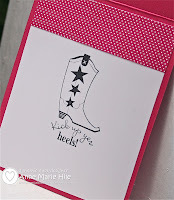 Eeeeek...pink cowboy boots all blinged out and polka dots to boot (no pun intended there!) yeehaw!!! Oh wow this is Fun Anne Marie. And the pic of your and your sister is adorable! Fabulous boots! This is a great card. Thanks for the inspiration. Ann Y .
I love your card! Everything about it is perfect! Great take on the sketch as well. What a fun card! You were definitely in your element on this one and how fun to share it with your sister! Great picture too! What a great picture of the both of you!! Love it! And the card!!! The sentiment is so fun with the boot!! This is a fun combination! Hope to play this week! I knew that I needed this stamp set and you've just proved it! You totally rocked both challenges! Simply 'boot'iful. Love the bling on the boot and the gorgeous polka dot ribbon. Fun card! And pink and black totally rocks! Fantastic job! Thanks for sharing! All the polka dots - I love your card! And the cute cowboy boot - awesome! Oh my gosh! This is so stinkin' cute! I love each and every detail. You are the 'Detail Queen'! Thanks for sharing with us at Freshly Made Sketches this week! What a scream .... I love this Anne Marie! This is boot tootin fabulous ... where else in the world would you get a pair of pink cowboys boots .... love it!!! Your card is just terrific! Congratulations on being crowned Princess for your fantastic blingie boot card!! Love all the new goodies my friend! What an awesome pink boot!!!! 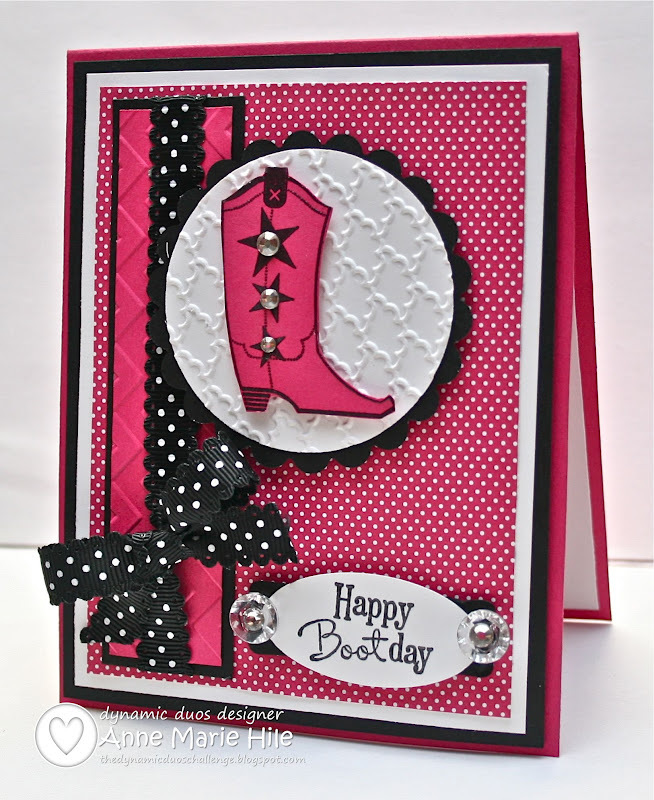 Your card is pure eye candy with those hot pink boots! Yee-haw!! I love the embossed circle, the bling - well I just love it all!